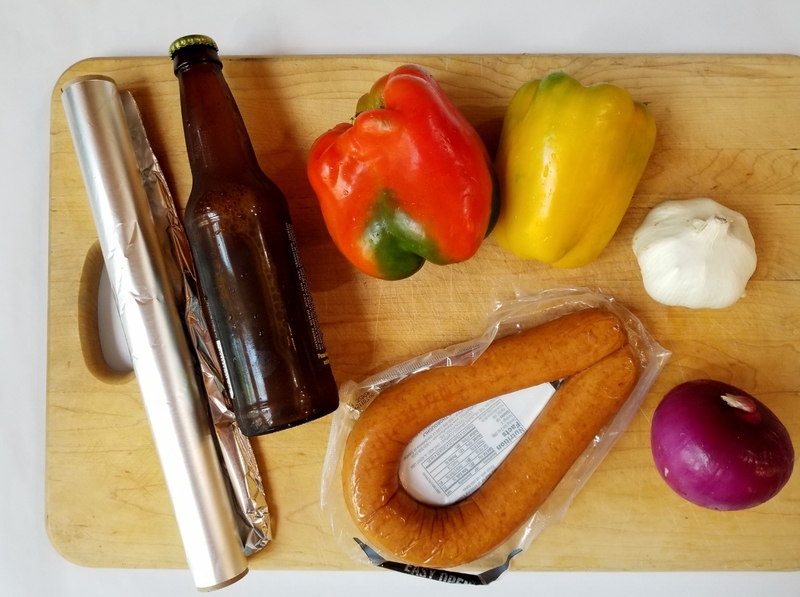 This recipe for beer-braised sausage and peppers came together very fast, like I had those bundles of meat and veggies wrapped up within 10 minutes! The recipe was very easy to follow too. So much easier than last month’s ice cream tacos on the cover of Rachael Ray Every Day. So. Much. Easier. Plus, there weren’t very many ingredients. The recipe did call for andouille sausage, but I couldn’t find any at the grocery store. I ended up buying some smoked kielbasa, which was a delicious substitute. Another change I made was omitting the celery. I didn’t have any, and it really didn’t sound right to me to put celery on the grill. I love the colorful ingredients…and the beer! After a few minutes of chopping, everything was layered onto the aluminum foil. These were looking pretty darn good already! There’s little mess involved when you are cooking in foil! But what can be even better? How about a drizzle of olive oil, seasonings, and a splash of beer! This recipe is totally made for our Wisconsin family (disclaimer: my kids don’t actually drink beer)! 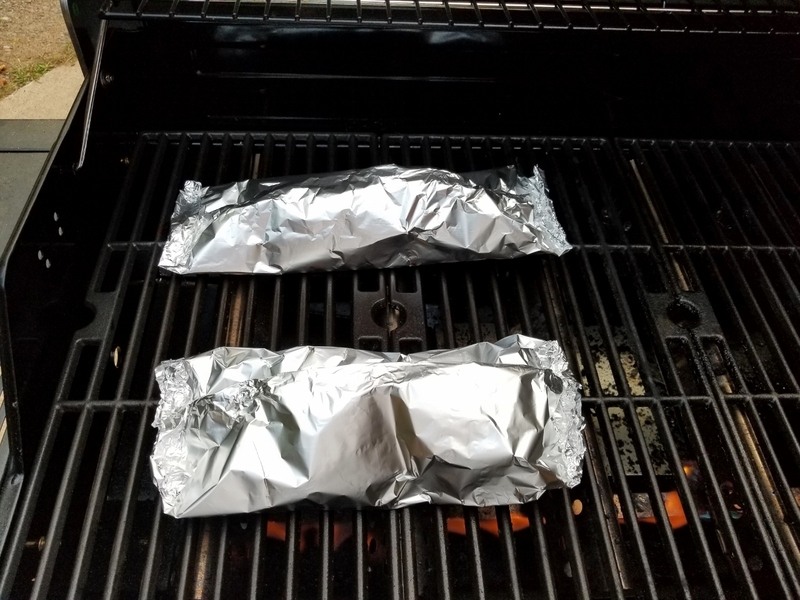 The foil packs were sealed up and placed onto a hot grill. Now for a little clean up, while these grilled for 20 minutes. Wait! There’s no mess! 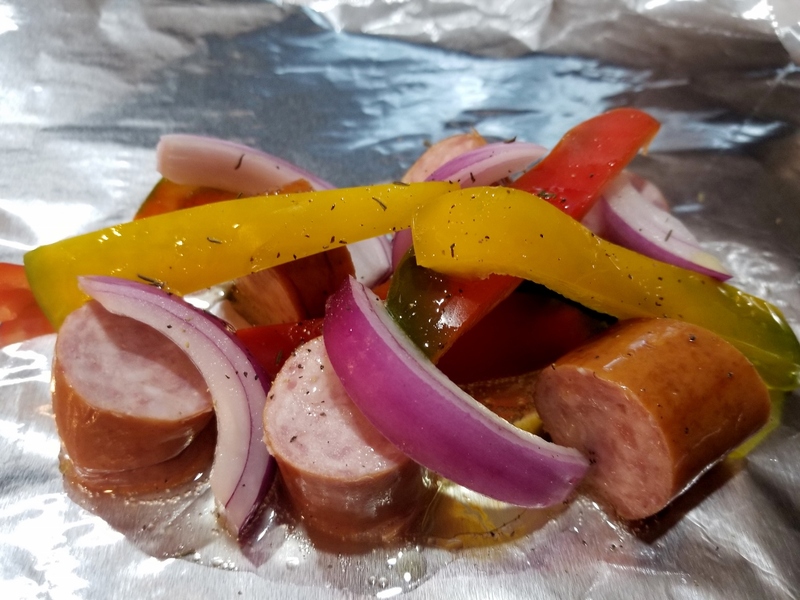 Cooking in foil is great! I don’t really trust my “blind grilling” ability, but that sizzle sounds delicious! The packets were turned once after 10 minutes, and I was starting to feel pretty proud of myself. This cook the cover is turning out to be a piece of cake! Now it’s time to eat. Oh yeah! I did good! Charred sausage and vegetables are the perfect combination. Everything was juicy (no beer flavor) and absolutely delicious. 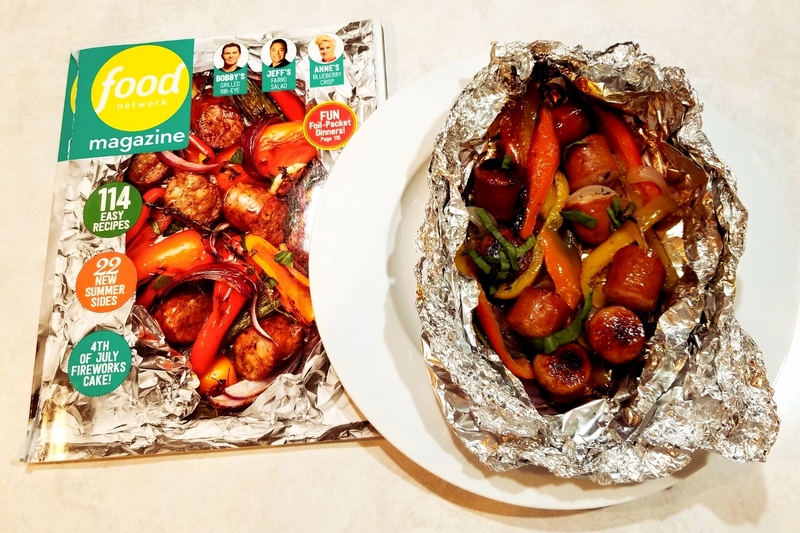 This meal was very easy to prepare on the grill, and the magazine actually had a number of recipes that were prepared in foil. I just may have to try another one! We are feeling a little healthier after all the vegetables in this meal, so for next month, I’m going to cook whatever is on the cover of the November issue of EatingWell. I’m guessing the dish will have something to do with Thanksgiving, and that’s a meal I have never cooked! I challenge your family to pick up the November issue of EatingWell and join us! What a fun challenge! I love it! And what a great dish – yours looks wonderful! Thanks Patricia! It is fun! Oh my gosh this is fabulous! I made a few Cook the Cover recipes like this last year, then never got around to posting them up. Vicki, I am so ready to take on your challenge. I’ll try to get right on it this month. When I do it I’ll tag you in the post! Thanks Denay! Definitely tag me so I can see what you made! Wow. 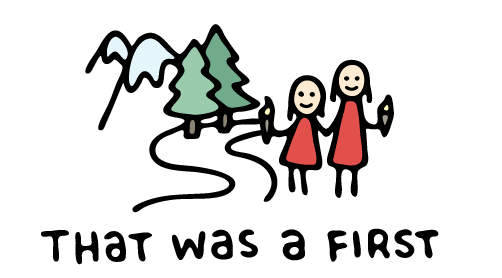 You did a great job. Fun idea too. 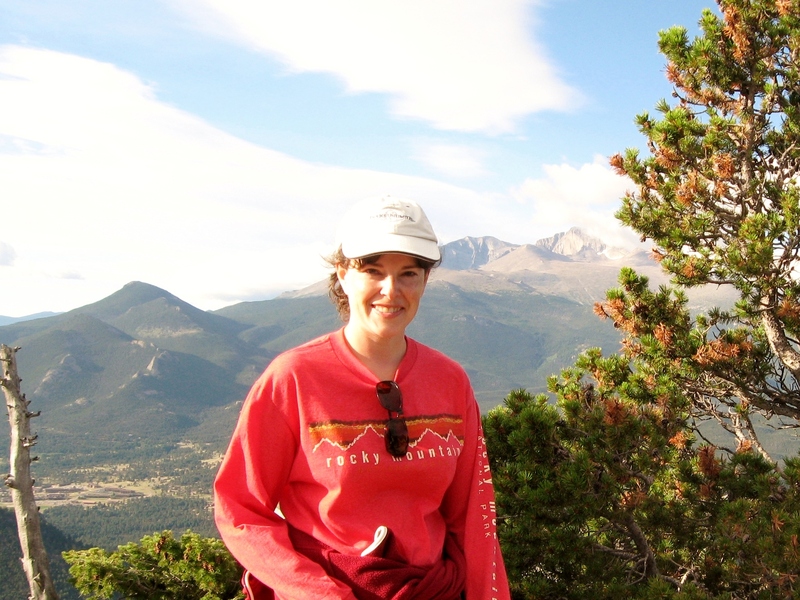 Thanks Elise! It’s a fun thing to do every month! These look amazing! What a perfect spin on a tinfoil dinner! Thanks! Easy to make and easy to clean up, love cooking with foil!